The Great Communicator A surprising headline to find on page one of today’s Boston Globe Sports section. 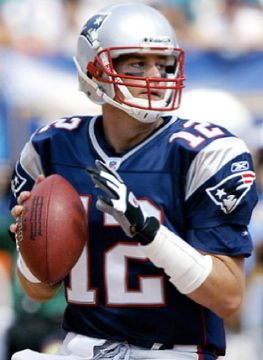 The article’s analysis of Brady’s role as a communicator and coach on his team offers the following ten tips for managers in the workplace. Managing is a continuous process. Managers should have a crystal clear sense of their role. Managers need to listen, be open to questions from their team members. Managers need to demonstrate a proven ability to execute. Managers need to have a clear understanding of their company’s “game plan,” and be able to drive that game plan forward. With consistent success comes greater trust by senior management to make independent decisions and improvise when necessary. Managers need to master the details (as Brady needs to be a “master of the minutiae that decides football games”) while still maintaining sight of the big picture. Managers need to be in sync with company leadership. Managers need to share both accountability and glory. Know why you’re meeting and recognize when you don’t need to meet. Think through your desired outcomes (insights, ideas, agreement, decisions, an action plan) because we move towards that which we think about. Distribute the agenda — including desired outcomes — in advance. Let people know how they can prepare to contribute fully in the discussion. Actively engage your participants. Select a perfect warm-up to jumpstart the discussion, ask fruitful questions, frame or reframe the discussion, connect the dots, pose “what if” questions, and challenge assumptions. Beyond driving the discussion forward, meeting leaders need to remember to stop talking, listen and leave “air time” for others! Encourage constructive participation. Make it safe for everyone to share their ideas. Control those overexuberant individuals who tend to dominate because they have so much to say. Watch for “bullies” who poison meetings with their negativity and judgment. With 75% of our meetings taking place by phone, it’s good to recognize the ways in which you need to facilitate phone meetings differently. Keep phone meetings smaller and shorter. Direct questions to specific participants or offices. Listen more intently for cues and signals to make sure people are staying engaged. Distribute parts of the agenda among the offices. Clarify take-aways, agreements, decisions-made, and next steps. Follow-up with a meeting report distributed within 24 hours. A future blog will troubleshoot challenging meeting scenarios (e.g. when the senior decision-maker gets called away minutes before your big presentation, or when you’re only on slide #7 (or 25) but you can tell the group has lost interest, or how to handle a meeting when no one is prepared for an important discussion…). What image best represents who we are and the reality others perceive about us? A recent experience renewing my passport got me thinking…I dutifully filled out the forms and went to the local FedEx/Kinkos to take new passport photos. I smiled, ready, but was told that we are supposed to look expressionless in passport photos. The photo that resulted is dull and almost scary-looking and bears no resemblance to the person I am — but it will represent me on my passport for the next ten years. Looking at this image of me you might imagine that I was at the very least depressed and, at worst, that I was dangerous. So tell me why “expressionless” is the preferred look for a document that will be used to evaluate our identity when we travel? Images create an impression. Images tell a story about you. Are you happy with what your image is telling others about you? When did we stop tuning in? Reveling in the warm and sunny weather today, I went for a walk outdoors instead of on my home elliptical. I intentionally left home the iPod, instead wanting to hear some of the signs of Spring. I eavesdropped into conversations (though only for seconds as I walked by), heard children squealing with delight as they rode their bicycles before the school bus arrived, noticed birds seemingly chatting, was greeted by neighbors who I rarely see all winter long…and was struck by a few moments of silence. The walkers rushing by with their ears plugged may have been enjoying their favorite tunes, but they were definitely tuning out. Not only do we live in a world overstuffed with information, but we’ve grown used to noise clutter and have grown unaccustomed to the sweet sound of silence. We’ve stopped really hearing though we think we’re listening all the time. Managers engaging in a courageous conversation with a team member talk at the other person rather than allow a moment of silence, time for the other person to think and respond. Presenters too-often miss the dramatic impact of a pause, worried instead that their silence will be misinterpreted as a mistake or nerves. They even fill those wonderful seconds without content with mindless fillers (um, uh…). Teenagers do their homework while listening to music rather than allowing their brain the total concentration that silence might afford. We’re told that Gen Y may actually focus better with noise in the background, because the noise actually calms rather than interrupts. How is that possible if we’re also now told that multi-tasking isn’t as effective as studies had indicated in the past, and that, in fact, once you interrupt what you’re doing to begin another task, you can lose up to 15 minutes trying to get back to your initial task. Or that the reaction time of drivers who talk on their cell phones is up to 60 seconds slower than the driver just driving. Imagine what we might achieve if instead of tuning out, we all tuned in consciously, with focus and commitment. What more would we hear? What else would we notice? Who else might we meet?